This week global PR firm Burson-Marstellar launched its 2017 World Leaders on Facebook report. The study contains some findings that are anticipated and some that are surprising. First, there are no shocks at the top of the list. Narendra Modi leads: his personal page is number one (40 million followers) and the official page of the Indian Prime Minister ranks third (13 million). Between these is first time entrant Donald Trump, whose personal Facebook following has quadrupled since he launched his campaign, now nudging 20 million. The White House page is sixth, with eight million followers inherited from the previous administration’s page (the content has been archived). Last year’s chart-topper Barack Obama (52 million) no longer qualifies for this list. The report does note the outgoing President’s numerous successful posts during 2016, including the first and third most popular posts: a family photo celebrating Easter, and a video of 106-year-old Virginia McLaurin dancing in the White House during Black History month. These results are unsurprising. India’s massive population drives Modi's Facebook popularity; Trump and Obama’s results reflect the global importance of the US presidency. But this should not cloud the worth of Facebook (and other social media) for these political leaders. Modi’s enthusiasm for Facebook and Twitter is widely recognised. On this front, he’s perhaps best known for his 2015 selfie with Chinese Prime Minister Li Keqiang. 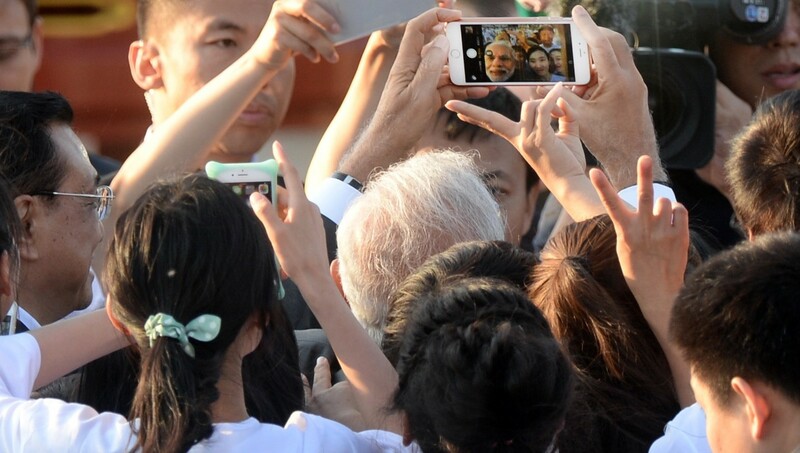 The trend of using the selfie as a digital diplomacy tool for leaders has spread. It’s a simple, clever tactic: as well as advertising the relationship, by tagging and sharing each other’s pictures on their respective pages, leaders increase their post’s potential reach. Modi’s success is predictable in part because he exemplifies sound social media public diplomacy. His popular posts are personal, warm, and engaging. One, featuring photographs with his mother, is the second most popular post in the Leaders on Facebook report. Similar informal posts, either featuring family or showing leaders in unguarded, lighter moments, were highlights for many world leaders. This ability to perform and connect is one of the pillars of Trump’s success; he is unadulterated and candid. This has appeal and is engaging. But his appearance on the list carries a different and larger significance, as his combative approach is far outside of diplomatic norms. He’s inspired some responses from the international community that – by diplomatic standards – range from cheeky slaps to angry meltdowns. Among the former is the picture tweeted by Swedish Deputy Prime Minister Isabella Lövin showing her signing climate legislation surrounded by seven female colleagues. The photo's composition echoed, whether intentionally or not, the image of Trump signing legislation, aimed at restricting US-funded NGOs providing access to and knowledge of abortion services abroad, surrounded by seven men. Among the latter is the online quarrel between Trump and his Mexican counterpart, Enrique Peña Nieto, over Trump’s ongoing promise to build a Wall between the countries and have Mexico pay for it. Former Mexican President, Vincente Fox, discussing the same issue, was about as undiplomatic as you can get. It’s tempting to mock Trump, but he’s impossible to ignore. Regardless of his eventual legacy, he has already demonstrated the need to rethink the consequences of digital transformations for international political communication. The risk is that Trump’s approach is simultaneously damaging internationally and popular domestically. If so, his legacy may include popularising a template for gaining political power and undermining the potential for digital public diplomacy. More optimistically, the Leaders on Facebook report also contains some surprising and powerful stories of how leader use social media to greatly extend their audience, shape their narratives and spread their messages. One is Cambodian Prime Minister Samdech Hun Sen (6.5 million followers; ranked eighth). He uses the platform to share snapshots of his holidays and grandchildren as well as nearly 1500 videos of him performing official duties, turning his Facebook page into a government broadcasting channel. His is one example of a leader that has had surprising success and appears to have strong localised impact. Last, but certainly not least, is Queen Rania of Jordan (over 10 million followers, ranked fourth). Well aware that social media has been used to radicalise and recruit extremists and to promote bigotry and hatred, Queen Rania took to social media to champion women’s and children’s rights, education, cultural diversity and peace in the Middle East. She is an example of a surprising success from a leader with grace, compassion, style and social media smarts.